The Johannesburg to New York City flight was on the Accra, Gold Coast (now Ghana), to Monrovia, Liberia leg of its journey. At 0301h during a pre-dawn approach to Monrovia's Roberts Field, the flight crew reported to the tower that the radio beacon at Dakar, Senegal was interfering with the Roberts Field radio beacon. After a 0315h weather report was sent to the pilots, all contact with the aircraft was lost. The flight was reported missing at 0410h on June 22, and an aerial search was conducted, but it was unsuccessful in locating the aircraft. At 1430h on June 23, a foot messenger arrived from the village of Sanoyie to report that an aircraft crashed into the side of a hill one day earlier several miles from the village and that everyone aboard was killed. 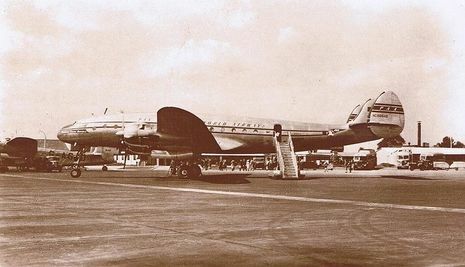 Pan American's Flight 151 departed Johannesburg for New York. At 08:12, June 21, after a routine flight and scheduled stop at Leopoldville "Clipper Great Republic" arrived at Accra at 21:25. Following a mechanical delay which required the changing of several spark plugs and a set of magneto points, the flight was dispatched and cleared to Monrovia, on an instrument flight plan at 16,500 feet with Dakar. Take-off from Accra was at 23:52Z and the flight climbed to en route altitude. At 02:20 Flight 151 requested clearance to descend. Roberts Field radio cleared the flight to descend to 3,000 feet. Five minutes later the flight was cleared by the tower controller to descend IFR over Roberts Range Station, and indicated that runway 05 was in use. At 02:37 Flight 151 was again given local weather for Roberts Field: cloud base estimated 1,000 feet, broken, light drizzle and haze, visibility 3 miles. At 02:55, nine minutes after its ETA, Flight 151 was heard calling Roberts Field.